Terry Crews is a well-known actor and former NFL player from numerous television shows and films and has gained a reputation as an all-around great guy. From his activism to his acting skills and sports background, he is an impressive public figure. 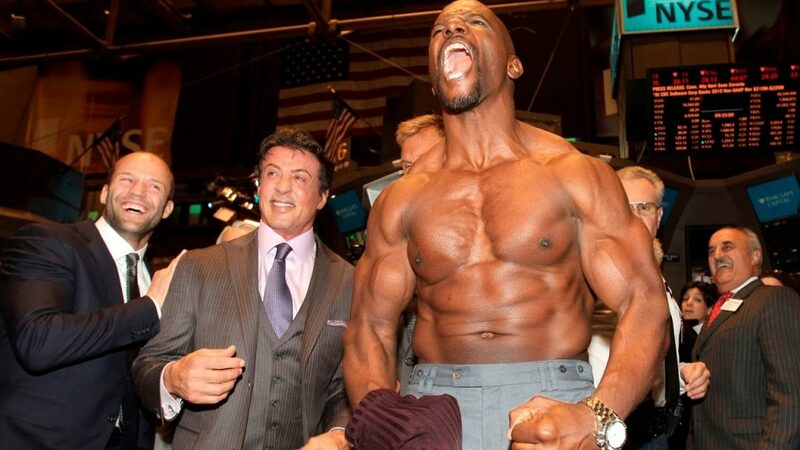 But one of the main things that fans tend to notice about Terry Crews is his fantastic physique and focus on health. Whether he’s a minor character or the star of a movie, Crews’ impressive body commands attention on any screen. Many fans surely wonder how the beloved actor has earned his muscles. What can such fans learn from Terry Crews’ workout plan to inspire them in their fitness adventures? Like all of us, Terry Crews had to start somewhere with his fitness journey. He has a lot to say about how he stays in shape and is always willing to give workout advice to help others become as strong as he is. In an interview, Terry Crews suggested that a great way to get started is to get to the gym, even if you don’t feel like exercising. Getting there is half the battle, and once you’re there, it’s so much easier to get a workout done. Another great tip from Crews is to mix your workout routine up, and not to force yourself to do things you hate. One of Terry Crews’ most iconic moves is making his pectorals (chest muscles) dance by flexing the well-developed muscles. This move has always impressed fans, and many people are in awe of his extremely built chest. The primary components of his workout routine are weight-lifting and cardio. Many moves include deadlifts, pull-ups, squats and bench presses. Much to his fans surprise, Terry Crews is a huge fan of running as well. Running large distances after each weight-lifting session is not unusual for him. The famous actor loves to talk about his fitness, so unsurprisingly, many workout and nutrition plans are outlining different aspects of Crews’ strength-building strategies. This workout routine compiles all that information into an easy-to-follow plan for anyone to get started and work towards being as strong as this action star. Terry Crews uses a lot of weight training as the basis of his workouts, but he also incorporates some body weight only moves, as well as lots of cardio. He has even said that his diet trick of intermittent fasting has provided him with plenty of success. This article goes over each of his most used moves and his diet building blocks, as well as how to do intermittent fasting yourself. Isometric Pushups – Pushups are probably the first thing that comes to mind when you think of basic workouts. However, Terry Crews likes to incorporate a twist on the classic pushup to build his pectoral muscles. To do this exercise, you start with normal pushup position, parallel to the ground with your back flat and low to the ground. Then, lower yourself as if to do a full pushup but stop about halfway down and hold yourself there for about 5 seconds. Make sure you feel the tension in your chest muscles during the hold. Do 20 reps of these pushups and repeat four times. Dumbbell Bench Press – A dumbbell bench press starts lying down on a gym bench flatly. Then, using appropriately weighted dumbbells (start small and work your way up as your chest and arms become stronger like Terry Crews’), lift the dumbbells straight up over your head as far as your arms reach. Do ten reps and repeat this workout three times. Dumbbell Curl – Dumbbell curls are another basic workout with excellent outcomes. Start standing up with dumbbells in your arms at your side. Then lift the dumbbells up towards your chest simultaneously. Do 10 reps of this exercise and repeat three times. Bodyweight Dip – This workout starts at a dip station at your gym. You begin by grabbing the handles and lifting yourself off the ground until your feet are hanging and your body is straight. Then, dip your arms down to about a 90-degree angle. Ensure that your feet don’t touch the ground, you want your arms to be handling your whole body weight! Do 15 reps and repeat this exercise two times. Hanging Leg Raises – Grip the handles of a chin-up bar with both arms straight up. Then, bring your feet up to your chin by bending at the knee and lifting all the way up. Hold for a second and try to do as many reps as you can in a row before stopping. Running – Terry Crews loves his cardio and enjoys running every day. Run long distances for endurance and mix it up with inclines every once in a while to add some extra muscle to your legs. Every fitness enthusiast knows that you can only gain muscle if your diet is as good as your workout. Terry Crews knows this and adheres to a nutrition routine that he claims keeps him looking young and allows him to have the incredible physique that he has. Crews swears by his intermittent fasting routine, which means he only eats from 2-10pm. On an average day, he sticks to lean proteins, plenty of high-density fruits and vegetables, and he is sure to take his vitamins! He chooses only to eat bread at night, so that the energy from the carbohydrates brings him through his morning workout. Terry Crews is also a believer in cheat days, saying that it’s important not to deprive yourself. He says that when he has a cheat day, he goes all out with the treats. 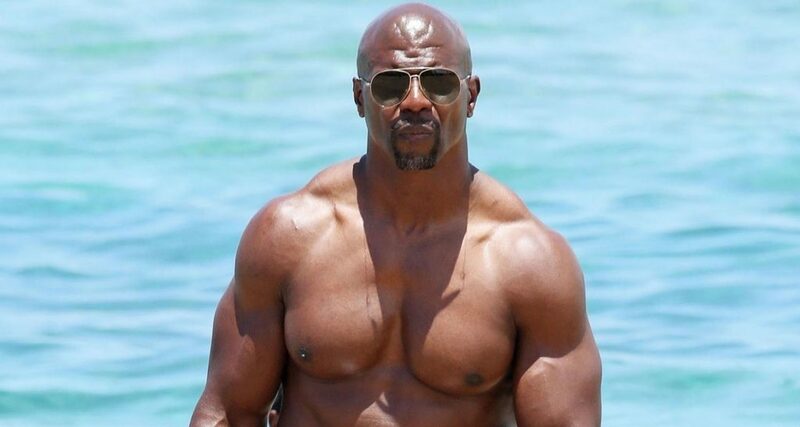 Terry Crews’ workout and diet routine have evidently had spectacular results that are visible in his amazing physique and health at the age of 50. This plan is a great starting point, with repetition and commitment, you could be on your way to being as strong as the man himself.